3 What Does It Mean When Someone Ignores Your Questions? Did you know you can make quiche without the crust? It's great if you're trying to cut back on carbs, avoid gluten, or simply want a more basic recipe. This custard-y dish is a spinoff on Quiche Lorraine, and can be considered a baseline recipe to expand upon. Feel free to omit the pancetta for a vegetarian version. Add in some chopped veggies such as broccoli or bell peppers for texture. Fresh herbs are also wonderful (such as chives, parsley, oregano, thyme, and basil). Have fun with it! Preheat the oven to 350 degrees Fahrenheit. Generously butter a 9-inch pie pan. In a nonstick skillet, cook the pancetta over low heat to render out the fat. After there's a solid layer of fat on the bottom of the pan, turn the heat up to medium and brown the pancetta for several minutes until crisp. Add the onions and cook for an additional 3 to 5 minutes, until fragrant. Drain off any excess fat. In a medium-sized bowl, whisk together the eggs, half & half, salt, pepper and nutmeg. Optionally, you can place the pie pan on a baking sheet to make transferring in and out of the oven easier. Place the pancetta onion mixture into the bottom of the pie pan, then top with half of the cheese. Pour the custard evenly over the ingredients, then top with the remaining cheese. 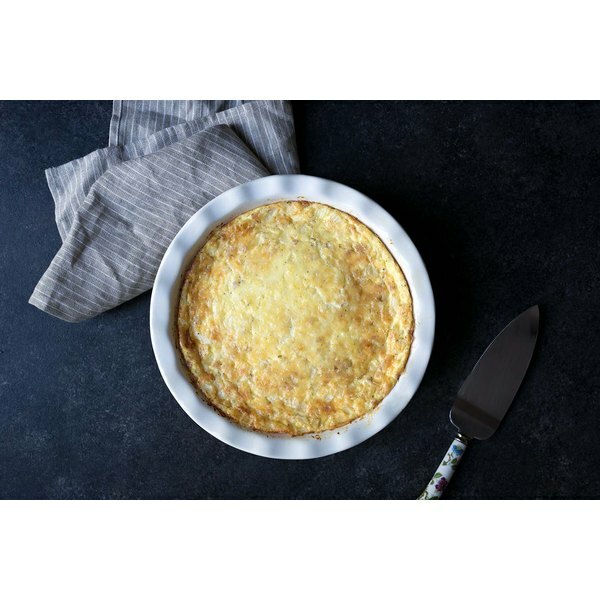 Carefully place in the oven, and bake for approximately 45 to 50 minutes, or until the top of the quiche is just slightly wobbly in the center but for the most part set. Allow to cool for several minutes before serving.